On April 23, 2015, Neal Colligan was notified that he won his appeal with the PA Office of Open Records (OOR) in the Colligan v. Tredyffrin-Easttown School District case, Docket No: AP 2015-0442. 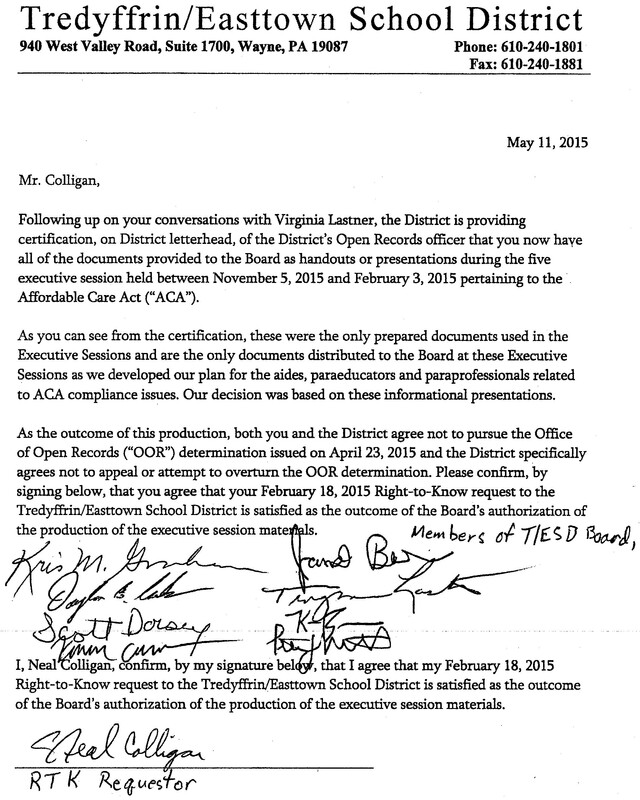 If you recall, Colligan’s appeal stemmed from the District’s denial in his right-to-know request regarding the five closed meetings of the TE School Board between November 2014 – January 2015, concerning the Affordable Care Act and the employment changes of the District’s aides and paraeducators. As a result of the OOR findings, the District was required to provide all requested Affordable Care Act records from the secret Executive Sessions withing 30 days. To comply with OOR, the District did make public on the website, some of the background ACA materials used in the meetings. The District was given 30 days to appeal the OOR ruling but after discussion between Colligan and School Board member Virginia Lastner, an agreement between the sides was reached. Although the Board was unwilling to make the agreement public, Neal offered the signed communication and certification by Art McDonnell for Community Matters along with his thoughts on the Right-to-Know process and agreement from the School Board. Below is his email and the signed letter from the TE School Board. Board members Kris Graham, Doug Carlson, Virginia Lastner, Peter Motel, Scott Dorsey, Jim Bruce, Kevin Buraks and Karen Cruickshank signed the letter. It is noted that because school board member Liz Mercogliano was not allowed to attend the Executive Sessions and participate in the Affordable Care Act discussion, she subsequently did not vote on the outsourcing of the aides and paraeducators, and therefore chose not to sign the letter. Attached is a letter the members of the TESB and I signed last night ending the RTK request in relation to the aides/paras Executive Meetings and the directive from the OOR to produce documents/information. As we’ve discussed, the issue at hand has already been decided (outsourcing) and the nature of the request made back on 2/18/15 for information used in the Nov, Dec, Jan Exec Meetings is pretty stale at this point. Having no interest in the District continuing to accumulate legals fees, we considered the matter closed. 1) I don’t know if the District fully complied with the OOR directive. They had introduced a string of e-mails in their partial information disclosure back in March. The request for information was broadly written and these, and other, items may have been included in complying with the OOR order. 2)The “settlement” came about through the work of Virginia Lastner. She authored the attached although it’s been through several revisions. This approach was one that was presented by the Board to us. 3)The letter itself is a bit awkward….not addressed to anyone, no signature identification (I added “Members of the TESD Board” so at least they signed in that capacity) but on District letterhead. 4)The District’s side of the agreement is to leave the OOR finding intact. These also stops the legal work on this RTK request…I hope. Finally, the District/Board would not make it public on their website but you are free to put it on yours if you choose. In this case, it was the best course of action. As the Requestor, I did not “get” much but possibly a stop to the District legal bills on this issue. Clearly, if the issue at hand were still undecided, we had the right to continue to push for all the materials granted by the OOR. During the last two years, the aides and paraeducators working in the Tredyffrin Easttown School District have lived with the threat of outsourcing. Given that we live in a wealthy Philadelphia suburb with an award winning, nationally ranked school district, it is difficult to understand how the TESD leaders would seek to outsource valuable employee jobs rather than offer health care benefits as required by the Affordable Care Act. Due to the delay of ACA compliance enforcement, the aides and paras were able to continue their employment through the 2014/15 school year. With the outsourcing threat present since 2013, residents continued to support the aides and paras, the only group of District employees not covered by health insurance (and the only group of employees without collective bargaining status). Many in the community questioned the Board’s decision to outsource to avoid the cost of complying with ACA and … if this was the right alternative for the TE School District. The journey of the District aides and paras moved forward during the 2014/15 school year, knowing that the Board continued to discuss their outsourcing future as a budget strategy. In a surprise move, the School Board approved a resolution to change the employment status of the 73 full-time aides and paras at the February 3, 2015 TESD meeting. The action was taken without notice, other than listing ‘Affordable Care Act Update’ on the meeting agenda, and after five secret executive session discussions held on November 5, 2014, December 16, 2014, January 12, 2015, January 20, 2015 and February 3, 2015. The Board’s February 3, 2015 action to outsource disrespected our expectation of good government. Some residents believed that a PA Sunshine Act violation had occurred by the Board’s action, whether by misinterpretation or misapplication of the language of the Act, or … by intention. Adding insult to injury, the affected group of aides and paras, learned of the Board’s decision via email at 10:30 PM following the February 3 Board meeting. The Sunshine Act defines when government bodies must conduct official business in public and private, when they should allow public comment, and how and when to advertise meetings. The Act is a mechanism to increase public participation in the democratic process by minimizing secrecy in public affairs. The School Board has had a longstanding practice of meeting in executive session before its regular meetings. In the case of the February 3 policy decision regarding the Affordable Care Act, the discussions were held in private during 5 Executive Sessions, out of the light of the public eye and without benefit of public deliberation. 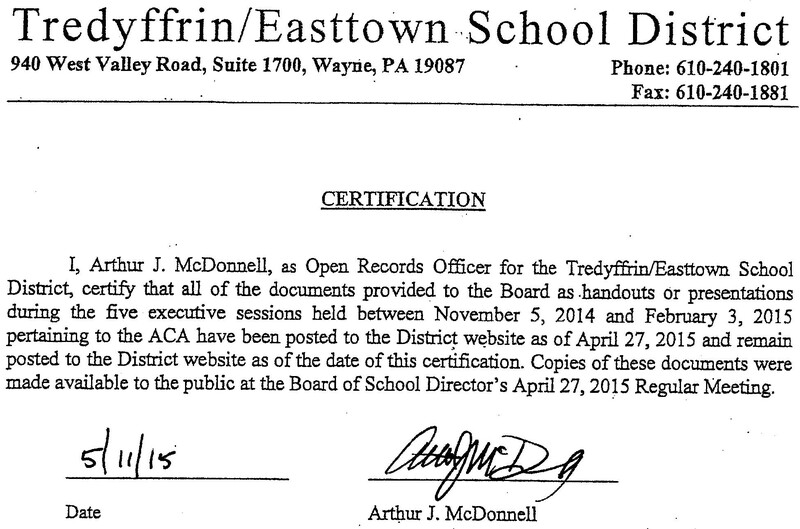 Believing that the Board’s actions of February 3 regarding the aides and paras violated the spirit and letter of the Pennsylvania Sunshine Act, a small group of concerned citizens (Neal Colligan, Ray Clarke, Barbara Jackson, Peggy Layden, Jerry Henige and I) sent a February 13, 2015 letter to the Board. The request was simple … they asked the School Board to re-open the outsourcing discussion at the School Board meeting on February 23, to provide a thorough financial analysis of the ACA options and strategies, an explanation of suggested policy changes, and to allow for adequate resident commentary. As residents, these residents believed that with quick action at the February 23 meeting, the Board could remedy the process and maintain the trust of the community in the integrity of the District’s governance. The resident’s suggestion to re-open the outsourcing discussion was disregarded. Troubled by the dismissive and trivializing response, it remained clear that the District had not provided adequate notice to the public regarding the proposed policy changes nor specific reasons for each of the five Executive Session discussions of the Affordable Care Act; further adding to the Sunshine Act violation case. Residents and signers of the February 13 letter appealed to the Board to step from behind the words of the solicitor, to take the situation seriously and to think independently. Again, there was no response from the Board in this regard. “All records relating to the implementation and execution of the TESD Resolution of February 3, 2015 regarding the Affordable Care Act updates since November 1, 2014, including all documents used to formulate, communicate, explain or justify the ACA Resolution not disseminated in public meetings. Your response and timing of response in this matter is very disappointing to me. I’ve made a number of Open Records requests over the years and this is the second one DENIED. Interestingly, those are the only two responses that took the maximum 30 days to receive. While you are certainly within the boundaries of the law on these responses, I would think a Denial could be formulated much sooner in the process. Water under the bridge…. My request was plainly written and, I assumed, easy to understand. I was asking for the documents related to the closed Executive Sessions that occurred before the presentation on February 3, 2015 on this year; to the extent they were available and public. What I received (attached) was the Power Point presentation from the 2/3/15 meeting and several e-mail chains between citizens and Mrs. Lastner dated after this critical meeting date. Added to this was your denial that includes three different legal reasons for the denial of the request. Wholly unsatisfying to this member of the community who was as puzzled as the rest of us regarding how a sensitive issue like this could have been made in a series of closed-door Executive Sessions. I was hopeful that some light could be shed on your deliberations and decision-making thought matrix but that is not going to be the case. It seems you have done a great deal of legal work here although the legal opinion and defenses articulated in your reply likely did not take outside research. I’m sorry if you choose to spend valuable legal dollars just to deny this request. If that was the intent, the response could have been forwarded last month when I made the request for Open Records. The inclusion of post 2/3/15 items was outside of the scope of my request and it is my firm hope that you did not pay for legal review of these (and other post meeting communications) for redaction/exclusion for this Open Records response. I’m not a lawyer and will not argue your various legal reasons for denying the request. I know plenty of smart lawyers would tell me the counter to each of these defenses but I’m not looking to play that game. I do know that there are many groups/organizations/people/firms dedicated to good and open government in the Commonwealth. I’m also aware that the process for appeal of Open Records denials is a fairly simple and user friendly process…this is to insure that average citizens can shed light on the deliberations of government bodies in PA. I’m very likely to take those steps and seek that help. First I will confer with the other members of our community who supported me in this endeavor. But I ask each of you: Is this the level of openness and transparency that you think appropriate for this issue? Really, when you stood for election to your seat; is this the relationship with the community you wanted? This is not the first time that transparency has become as issue; isn’t there one/some of you who would like to see this relationship change; the School Board become more open in process? I know the answer is YES but we need someone brave enough to voice the opinion and insist on transparent government and it can’t come from the public. Colligan shared the District’s response to the RTK request and his reply to Art McDonnell (above) with the other signers of the February 13 letter. The District’s response did not support the claim for exemption from public access and those claims are not applicable in this specific case. Although McDonnell states that the RTK was granted ‘in part’ — neither of the two records provided are germane to the request. 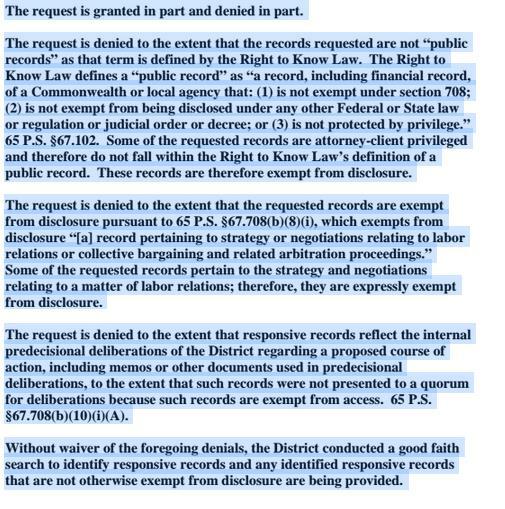 The District’s RTK denial request contained provisions for an appeal to Pennsylvania Office of Open Records, part of PA Department of Community and Economic Development, within fifteen business days. On March 28, 2015, Colligan took the next step in the process and filed an appeal with the Pennsylvania Office of Open Records office. He provided requested background documentation, including copies of the original RTK request, response and records from the District. The case, Colligan v. Tredyffrin-Easttown School District, Docket No. 2015-0442 is assigned to Appeals Officer Jill Wolfe, Esq. in Harrisburg. Colligan is required to provide all supporting information and a legal argument by Wednesday, April 8 to the Open Records Office. A final ruling on the appeal will be made within 30 days. Transparency in government is not a new issue. John Adams, 2nd president of the United States, wrote, “Liberty cannot be preserved without a general knowledge among the people, who have a right and a desire to know.” Through his Right-to-Know request and his open records appeal, Neal Colligan is asking for transparency and easily accessible information which should be public information. He is not looking to unearth government secrets … simply asking for public information. I am passionate about our community’s history and the preservation of our historic buildings and the demolition of the house on Pugh Road has had my attention the last few days. The discussion on the township’s historic resources will continue but I want to get back to other issues, including the TESD budget and the District’s compliance of Affordable Care Act. The school district held a special meeting on January 6 to present the preliminary budget proposal and for a ACA presentation by Rhonda Grubbs, Wisler Pearlstine attorney and Art McDonnell, District’s business manager. (See Community Matters related post). Following the ACA presentation, many questions remained. School board president Kevin Buraks told the audience that the ACA discussion would next be discussed at the Finance Committee meeting on Monday, January 13. I attended the January 13th Finance Committee expecting further discussion of the ACA. However, the decision was to postpone any additional ACA discussion to the next full school board meeting — upcoming on Monday, January 27. Although it was the decision of the school board members attending the Finance Committee meeting to postpone the ACA discussion, Pete Motel actively reached out to the community and asked that we provide our own ideas for compliance to the school board. Remember, all TESD employees are not currently offered health care benefits – facing the ACA compliance deadline, the Board needs to decide what to do about the aides, paras and substitute teachers, the employees not currently receiving health benefits. The Finance Committee meeting is not videotaped so probably few in the community are aware that Motel encouraged ideas and suggestions about ACA compliance from the public. If you want to help keep the jobs of the aides and paras from outsourcing, they need to have health coverage. This is important and the Board needs to hear from the public. Send your suggestions, (be specific) to schoolboard@tesd.net and share those ideas for discussion on Community Matters. Compliance with the ACA is not an easy task for the Board. There are many factors to consider and I think the Board left the ACA presentation with as many questions as members of the public. The ACA presentation gave a negative, ‘cannot be done’ slant to the compliance situation. However, there are people in the community that believe that there are other options for the Board to consider. – Provide the “current” healthcare plan to full time aides, paras, subs, and so make the non-discrimination test moot. Make reasonable estimates for and publish all the assumptions: premium share, family status, coverage provided, wage adjustment, coverage waiver bonus, etc. – Provide a minimum “basic-care” employee-coverage-only plan to full time aides, paras, subs and Admin. Deal with the Admin group as Keith has suggested on CM. Make assumptions as above. – Facilitate the formation of a union/bargaining group for either the Admin group or the aides, paras, subs so that their benefits can be bargained separately and avoid the non-discrimination test. – Cap hours/days of all aides/paras/subs at 27.5 hours/3.5 days. Flesh out the impact on students and management overhead and provide realistic estimate of any partially compensating salary increase. – Outsource as needed. Provide guesstimate of impact based on rates paid for current out-sourced employees and from last year’s discussions with vendors. I think that the Board should also have a table comparing compensation rates and all benefits (including PSERS) for aides, paras, subs in neighboring school districts. Perhaps the Board can also be encouraged to get direct feedback from the affected employees. There are web-based tools that could be used, for example, for a simple anonymous ranking of employee priorities (while of course recognizing that the priorities are not in practice independent and none can be guaranteed). As is often the case, last night’s Board of Supervisors meeting conflicted with the Finance Committee meeting of the School District. I attended the Supervisors meeting as I was particularly interested in hearing about any Chesterbrook Village Center updates. Prior to the regular BOS meeting, the supervisors held a public hearing on the proposed amendment changes to the Town Center zoning ordinance which would affect the redevelopment of Chesterbrook. The 122,216 square foot shopping center lost its anchor store, Genuadi’s supermarket in August 2010. With the departure of the 40,000 square foot grocery store, the Center saw a significant drop in foot traffic and began a downward spiral as the empty storefronts continued. The shopping center was sold at a receiver’s sale November 1 for $8.9 million to 500 Chesterbrook Boulevard, LP. As someone who lives in the western part of the township, I regularly use travel through Chesterbrook and I look forward to seeing its redevelopment. Lou Colagreco, attorney for the shopping center owner, offered eight suggested changes to the township’s Town Center zoning ordinance. After much discussion from the supervisors and with opinion offered from audience members, there were a couple of sticking points that could not be satisfied. Colagreco sought to decrease the parking requirement from 2.5 parking spaces to 2.25 parking spaces per townhouse, citing various national surveys and local development trends. Although Colagreco offered neighboring municipalities have decreased their parking requirements, he found little support for this change from the supervisors and definitely not from the residents, many of which live in Chesterbrook. He also hoped to change the stormwater requirements and exclude decks as part of impervious coverage requirement. Because of the severity of stormwater issues in the township, lessening this requirement also did not meet with a favorable response, particularly since these changes would affect the entire township, not just Chesterbrook. After a couple of hours of discussion, the supervisors decided to send the suggested Town Center zoning ordinance changes back to the Planning Commission for further review and revisions rather than approving. I am anxious for the redevelopment of Chesterbrook and look forward to seeing the preliminary draft of the plan when it is available. The Town Center ordinance combines commercial and residential usage. Last night marked the last official supervisor meeting for supervisors Michelle Kichline and Phil Donohue; we thank them their commitment to the community and their public service during the last four years. On Monday, January 6, Murph Wysocki and Mark Freed will be sworn in and join the Board of Supervisors. Ray Clarke attended the TESD Finance Committee meeting and I thank him for providing his notes from the meeting. I note that the school board is resurrecting the Public Information Committee which is great news. If you recall, Debbie Bookstaber chaired this committee but after she left the school board, the committee was disbanded. At that time, Betsy Fadem stated the committee was not necessary, as each existing committee would provide their own public communications. But as we have seen during the last year, communication could be improved and I am grateful that Scott Dorsey is taking over this role to chair the committee. Ray also mentions that the Board intends to have public discussion on the Affordable Care Act and its requirements. The aides, paras and substitute teachers received a reprieve on this TESD jobs for one-year that runs until June 2014. To meet the ACA requirements will require the school district to offer affordable health insurance to all employees so this discussion should start soon rather than later on this topic. A note before getting to the meat of last night’s TESD Finance Committee – some encouraging signs on the communications front. The Public Information Committee has been resurrected, now under Scott Dorsey’s leadership. The FC meeting was structured to facilitate community input (although the competing Township event limited participants). And the Committee took steps to add back historical context to the monthly financial statements, so our analysis should become easier. Time will tell on all of the above, but the intent seems real. 1. 2013/14 Forecast. The budgeted $1.7 million deficit is now projected to turn into a break-even (including the one-time TEEA bonus). This is driven by the $0.65 million benefit from the Vanguard settlement, a $1.4 million favorable variance in salaries (factoring in all retirements, resignations, leaves), a $0.2 million reduction in salary-driven benefits, a $0.2 million savings in transportation, offset by (non-salary) special education expenses that are $0.85 million over budget. So, yet again, the budget under-estimated the salary “breakage”. The special ed development is perhaps more of a surprise and although it wasn’t clear, seems to be made up of outside tuition and legal costs driven by an unexpected influx from early intervention programs. That seems like an especially large variance given a total special education budget of $16 million. 2. Preliminary 2014/14 budget. The FC voted to approve for discussion at the January 6th Board meeting a draft that calls for a 3.2% property tax increase: the 2.1% Index and 1.1% PSERS exception. This looks to me like a budget with enough leeway to absorb costs of a TEEA agreement and AHA solution, both of which are left as “status quo” in the first pass. The ~$3 million expense increase is a result of a $1 million net PSERS increase, and a $2 million increase in “other” expenditures. The breakdown of the “other” number was not quantified, although Special Ed and Maintenance cost increases were cited. Interestingly healthcare costs are expected to be flat. The salary line is level also, but results from a number of puts and takes: absence of the $1 million plus bonus and savings from the new TENIG agreement, offset (completely?) by nine additional teachers, six due to enrollment, two due to special ed, one for mental health. No sign of the (in) famous breakage in this calculation, though! 1. The Board needs to be persistent in seeking a full accounting of the projections, as the high level numbers net out and obscure many different trends (more detail was requested). Also, it’s too easy, as was done last night, to place the blame on Harrisburg/PSERS, when in fact that’s only one third of the expense increase. Everyone last night quickly accepted that all cost savings opportunities have been implemented after the efforts of recent years. It may be helpful to the community to recap what possible next steps would be (eg are we really down to major and unlikely options like class size, arts programs, transportation, facilities capital spending**, etc., and what would be the magnitude for those?). [**Capital spending is paid for by tax payers, too]. 2. The size of the Special Education program in total, the “miss” this year and continuing above-index increases are clearly a budget concern. The district has taken steps to control costs, but those are being overwhelmed. I think it would be helpful to the community to have an exposition of the program, perhaps at an Education Committee meeting? A description of the services offered, the utilization and price trends, steps we have taken and plan to take, comparison with other districts and so on. 3. There is no sign yet of any increase in the real estate assessed base value, which is budgeted flat, but signs of development suggest that any change will be to the upside. On the other hand, residential development will increase enrollment, and as Dr Motel is quick to remind us, that’s a net negative for the school district. So the pressure on real estate taxes to increase above the rate of inflation will continue. (Although PSERS will be more or less leveled out by 2018/19, even with the just-released slight increase in planned contribution rates). I continue to believe that it makes sense to share the tax burden between property and income via an EIT, although of course implementation would be a huge problem. 4. The community needs to pay attention, starting with the January 6th Board meeting. Although the budget evolves as more data comes in, and exceptions advertised may not be requested or indeed taken, early numbers have a way of being sticky. A final note: President Buraks informed us that the district is putting together a full analysis of the options associated with the requirements of the Affordable Healthcare Act. This would be presented for community discussion rather than as a Board recommendation. The idea seems to be to do this soon, although no specific timing was given. 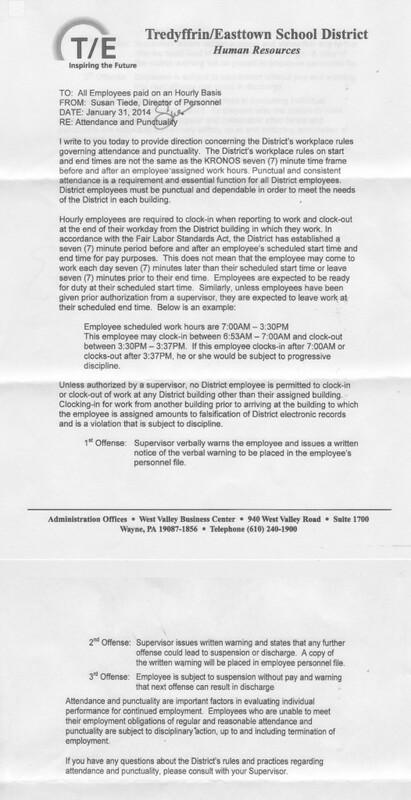 Obamacare Delay — Hours Restored for TE School District Employees for 2013-14 School Year! Exciting news today for the TE School District aides, paraeducators and paraprofessionals — their hours have been fully restored for the 2013-14 school year! This is wonderful news for the affected employees who faced major cuts to their hours — in some cases, as much as twenty-five percent. The restoration of hours of the aides and paras to their previous level is win-win news for the students, their parents and the community! According to an announcement on the District website this morning (see below), the District solicitor has confirmed that delay of the Affordable Care Act implementation for another year. Based on this notice, it is interesting that the policy-making decision to restore the employee hours comes from the office of the District solicitor, Ken Roos to the administration. As a result, the District has suspended the June 17 school board decision to reduce the hours of aides and paras to 27.5 hours or below. This may only be a one-year reprive for the affected employees, and they could find them in the same position a year from now, however … so much can happen in a year. For examples, the Federal government could change implementation requirements for ACA, specifically as it relates to part-time workers. With outsourcing of aides and paras off the table for a year and the restoration of their hours, the 2013-14 school year presents an opportunity for the District to fully understand the ACA insurance requirements for their employees. Rather than reducing the hours of employees to avoid Federal compliance laws, perhaps alternatives can be explored to provide affordable health care to all District employees. In an earlier post, I mentioned the idea of a citizens group to review Obamacare and the compliance requirements during the 2013-14 school year. As we have learned, the topic is confusing and needs further study — use the ACA transition period and learn more on the topic. As more information becomes available from Washington,the Board will be better positioned to work towards compliance for the following year. The hours for District aides and paraeducators will not be limited to 27.5 hours per week for the 2013-2014 school year as was previously announced. The District Solicitor has confirmed that the Treasury Department has delayed the implementation of the provisions of the Affordable Care Act relevant to the Board’s June 17 resolution directing the administration to schedule all District part-time employees, such as aides and paraeducators, for no more than 27.5 hours per week for the 2013-2014 school year to ensure that they meet the definition of part-time employees pursuant to the Affordable Care Act for the 2014-2015 school year. Pursuant to the Board’s subsequent July 8 resolution, the administration is now authorized to suspend the implementation of the Board’s June 17 resolution. IRS & Dept of Treasury provide further explanation on Affordable Care Act one-year implementation delay — Is this sufficient information to satisfy TE School District? Special thanks Roberta Hotinski for sending the link to the latest announcement from the IRS and the Treasury Department of the ‘Employer Shared Responsibility Provisions’ for 2014 which was released on Tuesday! Federal government Notice 2013-45 was provided as a follow-up to the July 2 alert from the Treasury Department announcing a one-year delay in the effective dates of certain Affordable Care Act provisions including the annual information reporting requirements and the employer shared responsibiity provisions — these provisionso of the ACA will now be fully effective for 2015 rather than 2014. The IRS followed up its decision to delay these key provisions by publishing Notice 2013-45 below which outlines the additional time for input from employers in an effort to provide time for employers to adapt to the health coverage and the reporting process. Notice 2013-45 provides the background and guidelines for the one-year transition period, including the the employer shared responsibility provisions. Is there sufficient information contained in this update to satisty the questions of the TE School Board and District solicitor? 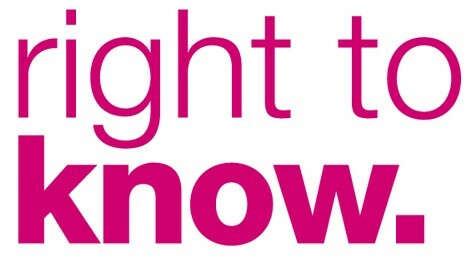 Upon review of Notice 2013-45, will the District reinstate the hours of the aides, paraeducators and paraprofessionals? This notice provides transition relief for 2014 from (1) the information reporting requirements applicable to insurers, self-insuring employers, and certain other providers of minimum essential coverage under § 6055 of the Internal Revenue Code (Code) (§ 6055 Information Reporting), (2) the information reporting requirements applicable to applicable large employers under § 6056 (§ 6056 Information Reporting), and (3) the employer shared responsibility provisions under § 4980H (Employer Shared Responsibility Provisions). This transition relief will provide additional time for input from employers and other reporting entities in an effort to simplify information reporting consistent with effective implementation of the law. This transition relief also is intended to provide employers, insurers, and other providers of minimum essential coverage time to adapt their health coverage and reporting systems. Both the information reporting and the Employer Shared Responsibility Provisions will be fully effective for 2015. In preparation for that, once the information reporting rules have been issued, employers and other reporting entities are encouraged to voluntarily comply with the information reporting provisions for 2014. This transition relief through 2014 for the information reporting and Employer Shared Responsibility Provisions has no effect on the effective date or application of other Affordable Care Act provisions. Sections 6055, 6056, and 4980H were added to the Code by §§ 1502, 1514, and 1513, respectively, of the Patient Protection and Affordable Care Act (ACA), enacted March 23, 2010, Pub. L. No. 111-148.1 Section 6055 requires annual information reporting by health insurance issuers, self-insuring employers, government agencies, and other providers of health coverage. Section 6056 requires annual information reporting by applicable large employers relating to the health insurance that the ————————————— 1 Section 4980H was amended by § 1003 of the Health Care and Education Reconciliation Act of 2010 (HCERA) (enacted March 30, 2010, Pub. L. No. 111-152) and was further amended by § 1858(b)(4) of the Department of Defense and Full-Year Continuing Appropriations Act, 2011 (enacted April 15, 2011, Pub. L. No. 112-10). Section 6056 was amended by §§ 10106(g) and 10108(j) of the ACA and was further amended by § 1858(b)(5) of the Department of Defense and Full-Year Continuing Appropriations Act, 2011. In this notice, the term Affordable Care Act refers to the ACA and HCERA, collectively. ————————————– employer offers (or does not offer) to its full-time employees. Section 4980H(a) imposes an assessable payment on an applicable large employer that fails to offer minimum essential coverage to its full-time employees (and their dependents) under an eligible employer-sponsored plan if at least one full-time employee enrolls in a qualified health plan for which a premium tax credit is allowed or paid. Section 4980H(b) imposes an assessable payment on an applicable large employer that offers minimum essential coverage to its full-time employees (and their dependents) under an eligible employer-sponsored plan but has one or more full-time employees who enroll in a qualified health plan for which a premium tax credit is allowed or paid (for example, if the coverage offered either does not provide minimum value or is not affordable to that full-time employee). Q-1. 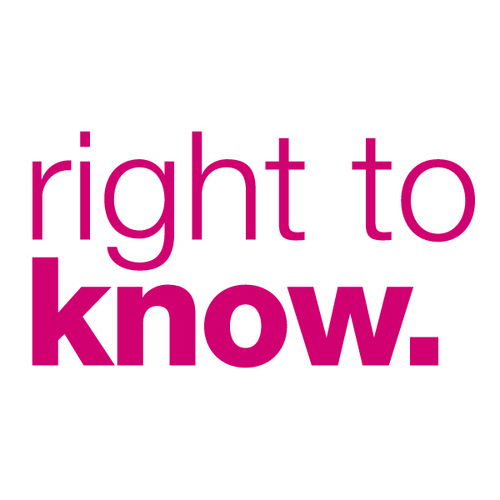 When will the rules be published regarding § 6055 Information Reporting and § 6056 Information Reporting? How will these provisions apply for 2014? A-1. 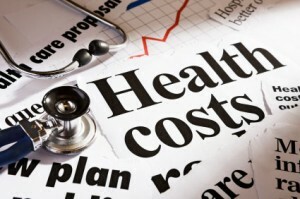 The Affordable Care Act requires information reporting under § 6055 by insurers, self-insuring employers, government agencies, and certain other parties that provide health coverage and requires information reporting under § 6056 by applicable large employers with respect to the health coverage offered to their full-time employees. Proposed rules for the information reporting provisions are expected to be published this summer. The proposed rules will reflect the fact that transition relief will be provided for information reporting under §§ 6055 and 6056 for 2014. This transition relief will provide additional time for dialogue with stakeholders in an effort to simplify the reporting requirements consistent with effective implementation of the law. It will also provide employers, insurers, and other reporting entities additional time to develop their systems for assembling and reporting the needed data. Employers, insurers, and other reporting entities are encouraged to voluntarily comply with these information reporting provisions for 2014 (once the information reporting rules have been issued) in preparation for the full application of the provisions for 2015. However, information reporting under §§ 6055 and 6056 will be optional for 2014; accordingly, no penalties will be applied for failure to comply with these information reporting provisions for 2014. Q-2. What does the 2014 transition relief for § 6056 Information Reporting mean for application of the Employer Shared Responsibility Provisions for 2014? A-2. Under the Employer Shared Responsibility Provisions, an applicable large employer generally must offer affordable, minimum value health coverage to its full-time employees or a shared responsibility payment may apply if one or more of its full-time employees receive a premium tax credit under § 36B. The § 6056 Information Reporting is integral to the administration of the Employer Shared Responsibility Provisions. In particular, because an employer typically will not know whether a full-time employee received a premium tax credit, the employer will not have all of the information needed to determine whether it owes a payment under § 4980H. Accordingly, the employer is not required to calculate a payment with respect to § 4980H or file returns submitting such a payment. Instead, after receiving the information returns filed by applicable large employers under § 6056 and the information about employees claiming the premium tax credit for any given calendar year, the Internal Revenue Service (IRS) will determine whether any of the employer’s full-time employees received the premium tax credit and, if so, whether an assessable payment under § 4980H may be due. If the IRS concludes that an employer may owe such an assessable payment, it will contact the employer, and the employer will have an opportunity to respond to the information the IRS provides before a payment is assessed. For this reason, the transition relief from § 6056 Information Reporting for 2014 is expected to make it impractical to determine which employers owe shared responsibility payments for 2014 under the Employer Shared Responsibility Provisions. Accordingly, no employer shared responsibility payments will be assessed for 2014. However, in preparation for the application of the Employer Shared Responsibility Provisions beginning in 2015, employers and other affected entities are encouraged to voluntarily comply for 2014 with the information reporting provisions (once the information reporting rules have been issued) and to maintain or expand health coverage in 2014. Real-world testing of reporting systems and plan designs through voluntary compliance for 2014 will contribute to a smoother transition to full implementation for 2015. Q-3. Does this affect employees’ access to the premium tax credit? A-3. No. Individuals will continue to be eligible for the premium tax credit by enrolling in a qualified health plan through the Affordable Insurance Exchanges (also called Health Insurance Marketplaces) if their household income is within a specified range and they are not eligible for other minimum essential coverage, including an eligible employer-sponsored plan that is affordable and provides minimum value. Q-4. What does this mean for other provisions in the Affordable Care Act? A-4. This transition relief through 2014 for § 6055 Information Reporting, § 6056 Information Reporting, and the Employer Shared Responsibility Provisions has no effect on the effective date or application of other Affordable Care Act provisions, such as the premium tax credit under § 36B and the individual shared responsibility provisions under § 5000A. The principal author of this notice is Kathryn Johnson of the Office of Associate Chief Counsel (Tax Exempt & Government Entities). For further information regarding this notice contact Kathryn Johnson at (202) 927-9639 (not a toll-free call).